We all love a sweet treat but it isn't always easy to find delicious free from recipes that are easy to bake at home. Today I thought I would share three of my favourite cookie recipes that are free from dairy, eggs and gluten or can be successfully adapted to be vegan and gluten free. 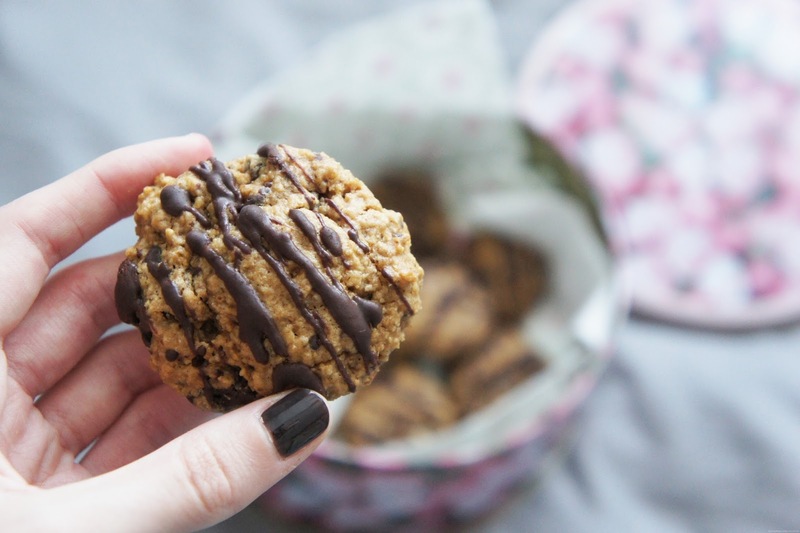 My most recent free from cookie find is this quick, easy and delicious recipe including oats, cinnamon and dark chocolate chips. The original recipe is vegan but to make these gluten free as well I found that a straight substitute of plain gluten free flour (I use Doves Farm) in place of the recipe's all purpose flour works perfectly and of course you can opt for gluten free oats. A dairy free spread in place of the vegan butter, which isn't as easy to get hold of in the UK, also works well. I've tried a whole bunch of vegan cookie recipes over the last few months but these walnut-based treats remain one of my favourites; I love them so much my friends even made me a batch for my birthday! The homemade walnut butter gives the cookies a great texture and whilst the recipe doesn't actually call for a dark chocolate drizzle I really love the extra chocolate boost! These chocolate cookies with crunchy almonds and vibrant orange zest are an amazing treat and a batch never lasts long around here! The combination of chocolate and orange is always a winner and the almonds add a great additional texture. The original recipe calls for an egg but I have tried making a vegan version by replacing this with a flax or chia 'egg' and I'm pleased to report they taste just as good, although they can be a little softer in texture. Opting for dairy free spread instead of the coconut oil/butter also seems to work well. I like to add on the zest whilst the cookies are still warm to give the orange a chance to sink in and give a stronger flavour. Oh boy. These look and sound amazing!